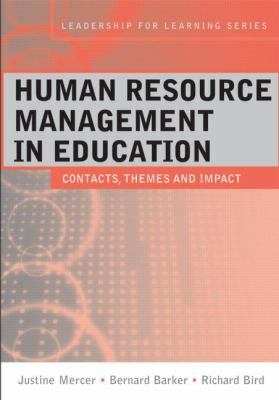 Human Resource Management in Education: Contexts, Themes and Impact Bernard Barker, Justine Mercer and Richard Bird How can human resource strategies contribute to the transformation of educational organizations? The effects of globalisation are evident in education policy around the world - governments from the USA to China are driving their education systems to produce more skilled, more flexible, more adaptable employees. The pressure to perform is all-pervasive which means that present-day leaders have to go beyond the principles of humane and equitable management practice to look for competitive advantage through strategies that are likely to enhance motivation, build capacity for organizational improvement and produce better value-added performance. This book examines the key issues surrounding human resource management in education today. Drawing on a wide variety of empirical research undertaken in different sectors and different countries, including the UK, USA, Hong Kong and the Middle East), the authors critically examine the normative, 'best practice in people management' paradigm that currently dominates the field. Finding that it falls short, they instead develop a coherent, consistent alternative perspective on HRM in education, taking full account of recent national and international trends. The relationship between leadership, the classroom and results is analysed and case studies explore the extent to which performance is enhanced by distributed leadership and constrained by social, political and economic contexts. The impact of these ideas on the leadership and management of people in education is considered and recommendations are made to guide those who aim to adopt strategies that improve the quality of life in schools and colleges for all those who work in them. The book is divided into three parts: Part I examines the current context of HRM, by critically analyzing three significant worldwide trends relating to education policy, government legislation and teacher culture; Part II explores two pairs of contemporary themes in HRM, by comparing the roles of leaders and followers, on the one hand, and contrasting learning and "greedy" organizations, on the other; Part III looks at how the context and the themes impact on particular contemporary practices in HRM, by analyzing the selection and development of professionals, the remodelling of school teams and the management of performance. This book carefully blends advocacy with evidence to ensure that it is powerfully relevant to both practitioner and academic audiences in the UK and elsewhere.Barker, Bernard is the author of 'Human Resource Management in Education: Contexts, Themes and Impact (Leadership for Learning Series)', published 2010 under ISBN 9780415412797 and ISBN 041541279X. Loading marketplace prices 111 copies from $50.32 How does the rental process work?